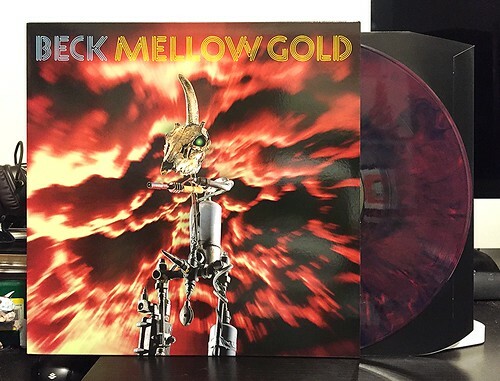 I can say, without hesitation that Mellow Gold is both one of my favorite and one of the most important records I bought back when I was in high school. Even though I've had the original pressing of this forever (the one with the alternate version of "Pay No Mind" on it), I still had to pick this new repress up for a few reasons. First, I'm certainly a sucker for limited variants of all time favorite records (this is numbered out of two thousand and sixteen copies). Second, I wanted a copy of Mellow Gold on vinyl that had the regular version of "Pay No Mind" on it. Lastly, I wanted a version that I could play without care and figured a remastered, 180 gram version of it would probably be the way to go. I was correct in thinking that. This pressing sounds spectacular. Everything is crisp and clear. The bass is warm and satisfying and even the more sparse acoustic songs just sound full and rich. Comparing it to my original pressing, it actually sounds a little cleaner I think, but both are quite good. I'm not sure exactly what they tweaked during the remastering process, but it certainly wasn't anything that changed the record other than making it sound great on vinyl. The music on this record it some of the most influential I've listened to. Listening to Beck made me start learning how to play guitar. It was the first time I listened to something and felt I could maybe play some of that. I first heard Mellow Gold from my friend Scott in high school, on cassette in the tape deck in his Dodge Sundance. "Loser" wasn't really on my radar at all and the first Beck song I actually ever heard was "Soul Suckin' Jerk." I liked it right away as I thought it had a cool Beastie Boys vibe to it. As we went through the record, I was just dumbfounded on how varied the songs were. By the time we got to the screaming chaos of "Motherfuker" I was sold. I went out and bought my own copy right away. Then I figured out there were other Beck records out like Stereopathetic Soulmanure and One Foot in the Grave. Then I started buying all of the singles. Then the import singles and from there on out it was a full on obsession. Trading bootleg tapes with other fans was essentially the first thing I ever used the internet for. All of this started to wind down for me when Odelay came out. Not that it isn't a great album, but Beck never felt the same to me after that. He always felt more polished than he had when I was first getting into him. He went from this insane misfit throwing shoes on TV to someone that people were suddenly taking very seriously. It was never as much fun after that. Though I've still bought and enjoyed every other record Beck has released, he was never able to recapture that lightning in a bottle of the Mellow Gold era for me. Twenty two years on, I still listen to the kazoo solo at the end of "Steal My Body Home" and wonder how on earth he tricked a major label into releasing this wonderful mess as his debut full length album. Genius.